This article was first published by the Guardian on 24 May 2014. 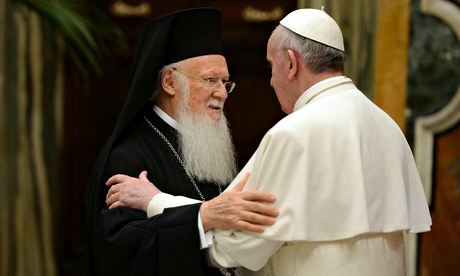 In Jerusalem on Sunday, Pope Francis will meet Ecumenical Patriarch Bartholomew, the honorary head of the Orthodox church. The two men, representing Christian traditions estranged for 1,000 years, will pray together in public. They will sign a hitherto undisclosed joint declaration. It is likely that they will give each other a hug. For many people a meeting between Christian leaders wearing different hats might not seem like such a political high point. But, in fact, it’s the reason for Francis’s three-day trip to the Holy Land. Fifty years ago, in January 1964, a pope and a patriarch met for the first time since the 15th century. It marked a growing rapprochement between Catholics and Orthodox Christians. It is that meeting, which also took place in Jerusalem, that Francis and Bartholomew are intending to commemorate. Observers may wonder, given the likely warmth of the meeting, whether the two churches are close to ending the Great Schism, a split that formally began in 1054 when Cardinal Humbert, the pope’s representative, marched into the Hagia Sophia in Constantinople and placed a papal bull of excommunication on the altar. Talks aimed at an eventual reunion have been held since the late 1970s, driven by the idea that division among Christians is a scandal. These days Roman Catholics have no beef with the Orthodox church. On their side the theological differences seem small. Yet experts say unity is a long way off – as in it probably will not happen this century. The two theological sticking points are the same now as they were in 1054. One is the pope. Orthodox Christians are happy with him as a figurehead, like the Queen, but are alarmed at the idea that he might intervene in their affairs or boss around their patriarchs. Catholic teaching, meanwhile, holds that the pope has “full, supreme and universal power”. The way around this is to define clearly the limited situations in which he might exercise jurisdiction over the east. The other problem is the filioque. This refers to the words “and the Son” added unilaterally by the western church to the Nicene Creed (the summary of the Christian faith agreed on in the fourth century). This inflamed east-west relations so much that in 867 AD, Patriarch Photius of Constantinople called the pope who approved it a “heretic who ravages the vineyard of the Lord”. The change itself is a subtle one. It annoyed the Orthodox church though, because it believed that any amendment to such a central part of the faith should be agreed by consensus at a council. Most theologians now think the filioque issue is minor – that it is an acceptable variant between east and west. Yet that relaxed approach won’t go down well with many Orthodox Christians, for whom it is still a serious heresy. And there’s the rub. A large number of Orthodox Christians still feel strongly that Catholics are heretical. This idea is probably most common in Greece. A visit to the country in 2001 by Pope John Paul II provoked furious protests, with one body of priests describing him as a “grotesque two-horned monster”. More recently, two Greek Orthodox bishops wrote an 89-page letter denouncing Francis, saying his election was the result of a Jewish conspiracy.